The other day we had beautiful weather and I decided to play outside with Aubrey. I had an activity in mind that I had wanted to do with her for a while and this was the perfect day to do it. For this particular activity we were going to play with water and make predictions about what would Sink and what would Float. I love it when we do something that captures her attention and gets her so excited about the process of learning new things. We played this game for a solid hour and she found new ways to enjoy it (she figured out the sponge soaked up water and she could “transfer” it to a new container and make puddles on the ground). 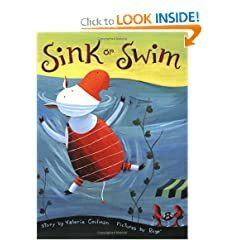 ” Sink or Swim “ by Valerie Coulman is a book about a cow who is determined to learn how to swim. He seeks out advice, gets all the equipment and never gives up! The story is a wonderful lesson about tenacity in the face of adversity . The cow just keeps trying and we get to see things that sink and float! 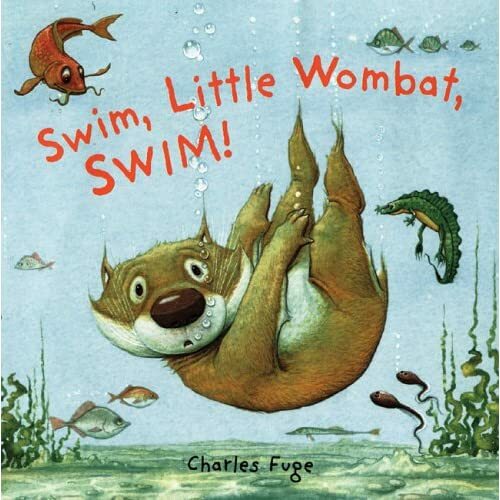 “Swim, Little Wombat, Swim” by Charles Fuge Little Wombat, the marsupial learns a lesson about making judgments. He meets an unfamiliar creature, a platypus, and makes fun of its walk and fuzzy face. But the two become friends after Wombat tries to show off and sinks in the pond where Platypus is swimming. Patient Platypus teaches Wombat to swim, and they celebrate with a race as Wombat’s friends cheer him on. we’ve done that game! You should see if she will watch Sid the Science Kid on PBS – they do fun things like this! !